As I noted in last week's Wordless Wednesday post, I have been in touch with a second cousin of mine, who has shared a few photographs (as well as some great stories) with me. Our grandmothers were sisters. Her grandmother was the second and mine the youngest of five daughters of Percy Earle Hunter and Marguerite Lysle. 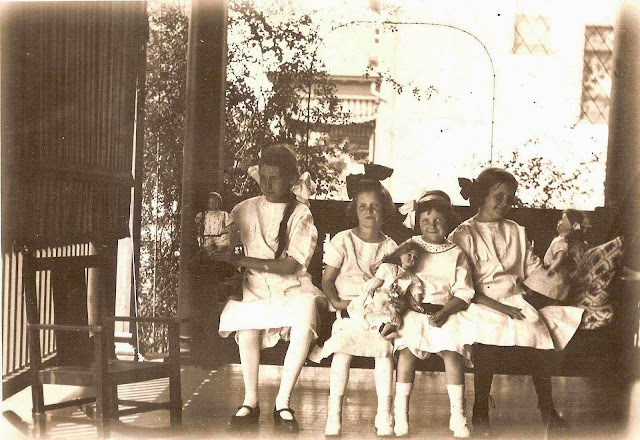 Here is a photo of four of the sisters. November 28, 2013 Update: Information provided to me by my second cousin was that this was taken in 1909. However, after consulting with my mother, I can confirm that this photograph was taken in 1914, after the death of the oldest sister, Marion, and I have corrected the identification of the sisters in the caption below. See Hunter Sister Stories for more information. For all my cousins on this side: take a close look and enjoy the family resemblances to those of us a generation or two or three from this family. I shared a 1911 photo of the five sisters here. What a great photo. I have been anxious to look at it since I got sick when you first posted this. Finally feeling better and going through the saved blog posts. Awesome photo. So much personality. So much rich information in one photo. Devon, thanks for reading and commenting. Yes, I was very excited to see this photo and knowing the sisters a bit, I can see their personalities coming through.